Old fashioned synthetic bristles were very scratchy, didn’t perform well and often fell out. Our bristles are created from revolutionary fibre combinations that are even softer than goat hair (said to be the softest natural hair). Our softest bristle is 0.1mm thick, while horse hair is 0.15mm which is a general indicator of softness. The fact that we can play with the density of this thickness allows us to vary with precision the softness to fit with the brushes’ job. This enables us to create a range of grooming tools that work beautifully for each of their chosen roles within the grooming process. Modulus is the ability to resist deformation/bending: an essential element in stiffness, the other being length. Our synthetic bristle has a much wider range of modulus than that of a natural bristle. When we look at animal hair ‘V’ synthetic bristles, natural hair bristle loses 40% of its stiffness after 10 minutes in water (though of course, it does regain strength with drying). However, this percentage will also be affected by the quality of diet of the animal, whose hair is being used for the brush. Just like diet plays a key role in healthy skin and hair for us humans. For synthetic material, you are looking at 28% stiffness loss after 10 hours in water. Bend recovery is also an important concept with bristles: this is the ability of a material to return to its complete original shape after deformation. Premium synthetic bend recovery is around 92%. Horsehair bend recovery is around 88%. 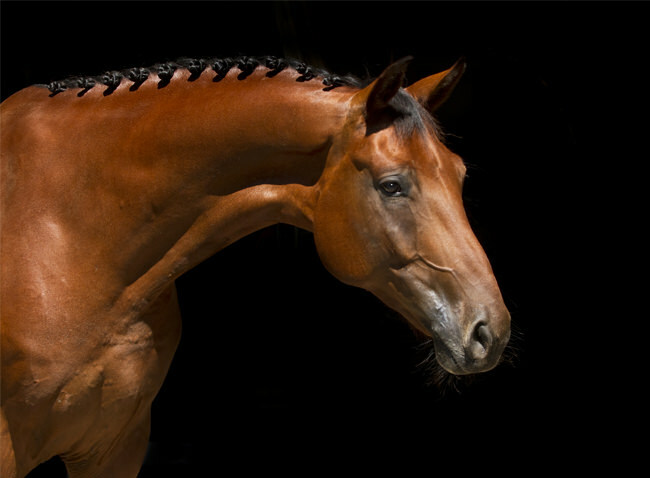 Tampico fibre (this is what you will find in natural bristle dandy brushes or any stiff equine brush) is around 40%. Our premium synthetic bristles perform percentages above that of natural bristles in both bend and recovery. How the bristles perform under stress plays an important part in their overall lifespan. While you won’t be soaking your brushes at length in water, you will be putting them through their paces through general everyday use. The strain applied on the brush is a significant factor in the lifespan of the bristle. Our brushes are filled with unique bristle patterns to increase the efficiency and ease of grooming so that the applied load strain from grooming is less. Thanks to the greater range in bristle moduli (which we have created specifically for each grooming task) our brushes can look forward to a very long life. Brushes with a smaller range of moduli and more basic fill patterns (e.g., natural horse, goat and pig hair bristles) increase the workload for natural fibre brushes so will have a much shorter life. Did you know that your brushes can get ‘fatigued’? ‘Fatigue’ resistance is the measure of the material’s resistance to breaking, splitting, or complete fracture. High-quality synthetic bristle has a fatigue resistance of 95-98%. Horsehair has a fatigue resistance of around 10%, and pig hair around 40%. While horsehair is a popular choice in grooming brushes, it is a well-known fact amongst brush makers that the best natural bristle is pig hair. So, in comparison to natural, synthetic wins again! With natural hair bristle, one of the biggest issues is bristle shedding. Natural hair bristle falls out as it cannot stand up to the eventual strain of the metal staple (all bristles on brushes of this kind are stapled into the hole) and every time one individual bristle is lost, the space that the bristle tuft has to move around increases. This, then makes it easier for more bristles to fall out, which in turn creates more space and this cascades until the brush is in need of complete replacement. Animal hair is never going to be able to maintain the antibacterial properties that our synthetic bristles boast. Our bristles self-cleanse after a couple of hours. Animal hair is porous so will absorb dirt and bacteria, therefore requiring more frequent washing which, as we mentioned earlier will make the natural animal hair bristles weaker over time. Synthetic wins again. So, why is horsehair still used in grooming kits? At Renwick & Sons, we’re not sure either. Think of the billions that the human beauty market is worth, and think how many times you’ve seen a retailer – high or low – selling a human hairbrush? Human hair is not exactly scarce when millions of people get it cut every day. Simply brushing your own hair with human hair does not make your hair more shiner or better conditioned, otherwise multimillion pound human haircare brands would be using human hair. The structure of hair is all the same across animals and humans. Hair, of course, will have differences between species like the structure of the DNA, and the exact makeup and organisation of the structure/components. But it’s not a radically different material. N.B. 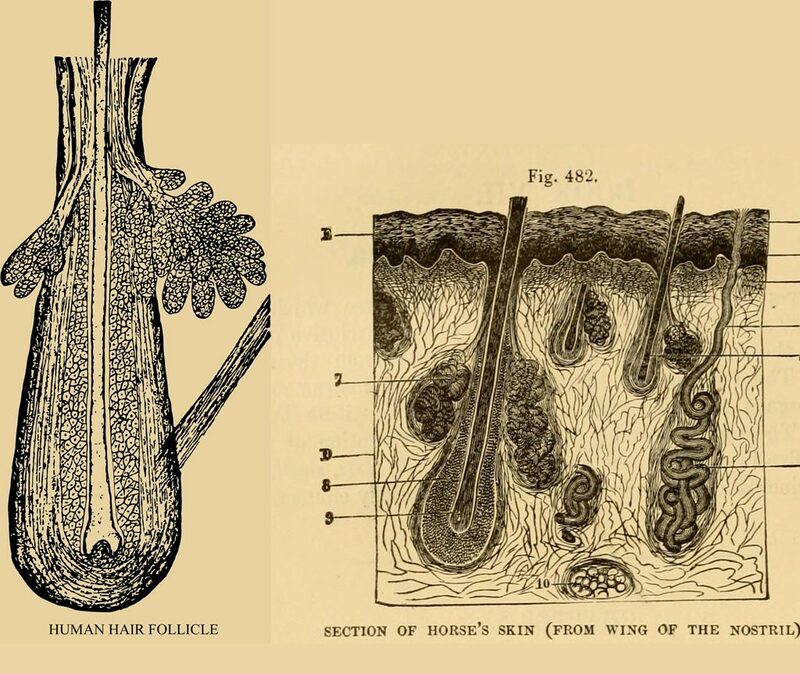 The remarkable similarity between human and equine follicles. If we think of the actual purpose of grooming, which is: cleaning, encouraging the production and distribution of oils from the skin to coat, and bonding. Using horse hair to brush your horse isn’t going to get better results. Using a high-quality synthetic bristle brush that incorporates proven bristle technology will give you great results. Hair is hair; it is dead above the skin. It doesn’t know what is brushing it. The horsehair used in brushes comes from two places: the mane, and the tail, (the former being the softer). Horsehair again varies from animal to animal and by the very nature of the product, will, of course, vary in quality and type. Producing natural bristle brushes which perform to the same standard time and time again is impossible. Our synthetic bristles, however, can be repeated with the same combination and precision which allows us to create each brush perfectly to fit the job it needs to do.